One of the prettiest walks in our town is along the Inner Harbour. Once the traditional grounds of the Songhees Nation, the route winds along the shoreline, offering glimpses of ocean, mountains and city. We started our walk around 4 pm, and on this November day, the sunset glowed in the sky, illuminating water and land. I was struck by the architectural elements of this tree etched against the skyline. Stark beauty softened by the brush along the base of the photo and the foliage at the top of the branches. We watched three float planes land, likely eager to find safe shelter before dark fell. A light haze wrapped the Olympic Mountains on the Olympic Peninsula. Looking back towards town, the Empress Hotel is seen on the left of the photo, and a variety of hotels elsewhere. Ducks and gulls paddled serenely on the water, unperturbed by the to and fro of boats and planes. The Coho ferry exited the harbour for a calm but chilly crossing of the strait to Port Angeles. By the time we turned to walk back to the car, the sun had fully set and the lights from the city twinkled in the twilight. We were glad for our heavier jackets and gloves. Winter weather is setting in. I'm hoping to link to Mosaic Monday, hosted by Mary of the Little Red House. That depends on whether or not she has power yet. I certainly hope so. It's been a long stretch for many people devastated by Hurricane Sandy followed by a second storm. Beautiful images of your inner harbor! I would love such a beautiful place to walk. The pictures are wonderful--I especially like the first one. Beautiful shot! A late afternoon walk is always beautiful! I love the sun low in the sky and you really took wonderful photos. It evens cools down quite a bit here in Florida! Beautiful images. The sunset is gorgeous. Such beautiful captures of this lovely place . . . it has been way too long since I have been there. What a lovely place to walk, lovely views of the harbor and sunset. Lorrie, your photos are beautiful! Have a great week! Each of the photos look like postcards. So beautiful. Several years ago I came and spent a weekend at the Empress Hotel and what I wouldn't do to be able to come again looking at your pictures. gorgeous sunset images Lorri. What a beautiful place for a walk. Thank you for taking me there, and for stopping by my blog today - I can't imagine being without a lemon tree! have a great week. Those colors are so soft and wonderful...very calming. Oh I adore that first image. Your previous post made my heart smile. 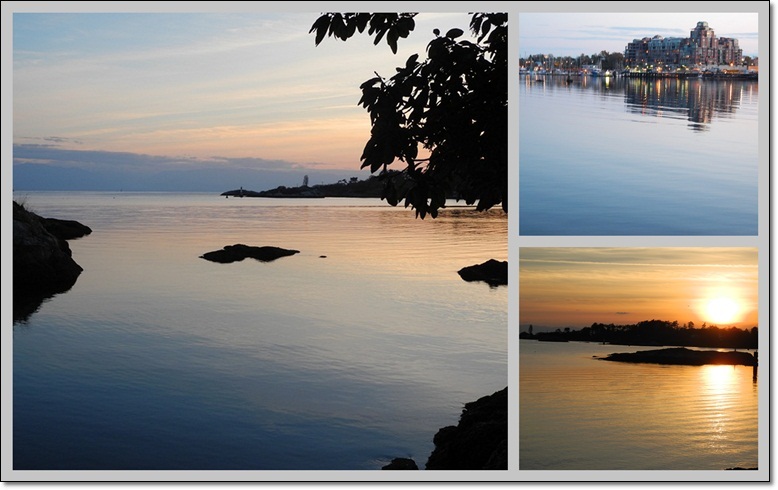 Beautiful photos of the inner harbour. I'm imagining myself there...and thinking of standing on the cruise ship deck while watching the sunset at almost that exact location not long ago. I think the tree silhouette might be my favorite. What a beautiful, peaceful walk this is, Lorrie. The water looks like glass and the sunset is magnificent! A very pretty evening to enjoy a walk. Your photos are lovely! Lorrie, thanks so much for the translation of Cuivre. The French did explore in our area. Missouri is part of the Louisiana Purchase and has a rich French history. The French flag is one of 6 that has flown over Missouri. Hubby J is French and German. There is also a rich German history in this area of our state. His French ancestor arrived here a few years before Missouri became a state. Pierre Audrain was in the first State Legislature and a Missouri county is named for him...Audrain. I enjoyed seeing your gorgeous photos. I am envied your gorgeous view! You took absolutely stunning photos to make us wanted to be there too! You live in Victoria? Ah.....beautiful place to live. The Island was our second choice after the Okanagan. Lorrie, you could stick a stamp on any of these and send them off to friends. Your photos are postcard perfect! My favorite is the first one! Thanks for taking us along on your walk. It's the next best thing to actually being there! A very pretty place to walk and relax - Thanks for sharing it all with us. Love that float plane landing. Our son-in-law flew float plane in the jungles of Borneo and it always has a special significance to me. So, so beautiful. I love the seaplane coming in to land.